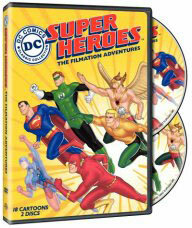 DC on DVD / DC Superheroes on DVD / TVparty! 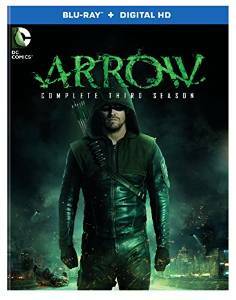 See more TV Shows on DVD collections here! 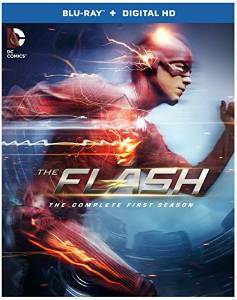 Warner Home Video has recently released a plethora of TV shows starring the DC superheroes on DVD and there are more to come. DC's legendary comic book characters have been around since the late-1930s and have proved popular on television for more than fifty years now - starting with The Adventures of Superman in 1953 and continuing to this day with Smallville on the WB network. The Adventures of Superman; The Complete Second Season has just been released and it's a delight to behold. If you haven't watched these episodes in their fully restored black-and-white glory then you won't believe your eyes (and you haven't seen the restored versions unless you bought the Columbia House releases - and then you would have paid $25 for four episodes). The first season of The Adventures of Superman was an pristine example of one of the few truly film noir television shows shot during what is considered the genre's classic period. For the second batch (26 episodes), the series took a more lighthearted approach while retaining just enough dark undertones and eerie music cues to make it fascinating. 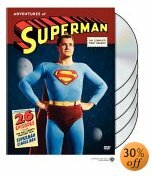 The Adventures of Superman, The Complete Second Season has charm to spare with timeless performances from an outstanding cast; besides the beloved regular cast (Noel Neill took the role of Lois Lane in season two), the best B-movie actors Hollywood had to offer were employed as the mad scientists, mob bosses, gun molls and everyday thugs Superman ran up against. It's a testament to the quality of these programs that it remains one of the only TV dramas of the 1950s that can be fully enjoyed today. Sure, the special effects are crude and the plots transparent but the production harkens back to a much simpler time; for instance, the scenes of Los Angeles in the early-fifties that fill in for Metropolis are priceless. Thanks to reruns on local stations for three decades and a run on TV Land in the eighties and nineties, four generations of kids have grown up watching The Adventures of Superman; it defines American television at its best in the same way I love Lucy or Gunsmoke do. Classic episodes in this second season collection include Panic in the Sky (Jerry Seinfeld's favorite episode), The Defeat of Superman (introducing Kryptonite), The Machine That Could Plot Crimes (Mr. Kelso), and so many more memorable scenarios. 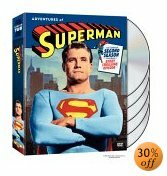 The Adventures of Superman, The Complete Second Season comes with sumptuous extras - you get two episodes with commentary by Noel Neill and Jack Larson (Jimmy Olsen), there's also a filmed tribute to Noel Neill and a promotional short shown in schools during the fifties, Stamp Day for Superman. This DVD set comes wrapped in a colorful, foldout package; loads of fun for the entire family whether you have young kids or not. Superman returned to primetime TV with Lois and Clark, The New Adventures of Superman in 1993; the second season of that series makes its debut on DVD as well, just in time to capitalize on Teri Hatcher's popularity on Desperate Housewives. 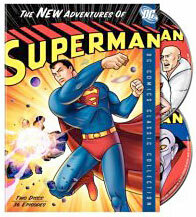 You get all 22 episodes of Lois and Clark, The New Adventures of Superman on six discs with commentary by actor and episode writer Dean Cain on Season's Greedings (with guest stars Sherman Hemsley and Isabel Sanford from The Jeffersons) and two mini-documentaries; Lois & Clark: Secrets of Season 2 along with Marveling Metropolis: The Fans of Lois & Clark. It's been a dozen years since these shows first aired; this was the season Justin Whaler took over the role of Jimmy Olsen and Lois discovered that Clark is you know who. John Shea is seen as Lex Luthor, Bronson Pinchot as The Prankster and Peter Boyle chews the scenery as Intergang boss Bill Church. As was the custom of the day, this season ended with a cliff hanger, but a true-to-life one - producers didn't know if the show would be picked up for a third season when filming wrapped on season two. 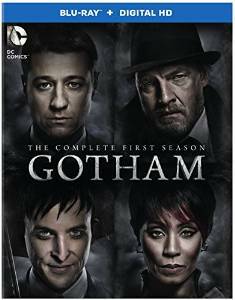 This collection represents the best year of the series run - not to be missed for fans of the show, especially. Were you a fan of the 1950s-1960s Superman comic books? 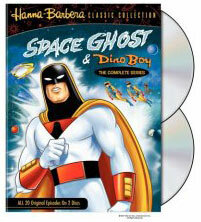 If so, you'll love this early-1990's cartoon series - if you weren't plugged in from the beginning (I wasn't). Arguably the finest of the TV adaptations of the Man of Steel, Superman - The Animated Series is a raucous romp through the DC mythology, incorporating iconic characters from the 1940s through the 1990s, even folding in Jack Kirby's 'Third World' of Apokolips and Darkseid. This collection includes the three-part crossover episode which kicked off the series's second year on the Kid's WB - 'World's Finest', which teams The Joker with Lex Luthor on one side with Batman and Superman on the other. 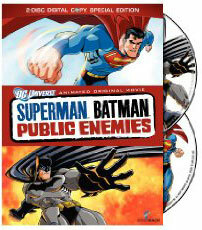 On two double-sided discs you'll get 18 action-packed episodes from the Emmy-winning series with insightful commentary on 'Brave New Metropolis' and 'World's Finest Part 1' by Bruce Timm, Paul Dini and other series notables. A mini-documentary and a limited-edition animation cel are also included. Not bad for less than twenty bucks if you order now online. 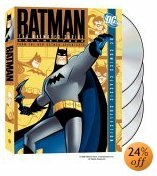 Also recently released: Batman - The Animated Series, Volume Four, also known when it first aired as the New Batman Adventures. 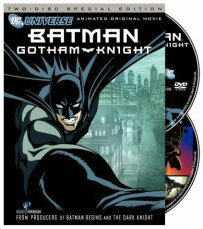 This collection delivers 24 episodes on four discs, commentary by animation creators on three episodes, 'Interactive Arkham Asylum' which examines the Dark Knight's colorful foes and more. While not the best of the series' run, Bat-fans will want it for their Bat-caves. When I was a kid, The Flash was my favorite of the DC stable. In 1990, The Flash debuted on CBS to cash in on a superhero craze ignited by the Tim Burton Batman movie. 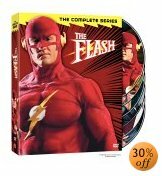 A critical hit, The Flash lasted one short season - a legion fans demanded it so Warner Home Video released the series on DVD. Filmed in 1990 (which meant lots of red, blue and purple neon, excessive smoke and left-over '80's fashions) it's Miami Vice meets the (Tim Burton) Batman movies. The fastest man alive seemed a bit plodding in this series, not so much in the more recent version! Perhaps it's because the producers couldn't decide whether they were doing a serious or camp show - if they hadn't straddled the line so finely The Flash might have had a chance. As it is, this DVD collection stands as the show's last will and testament, another likely collector's item in the future. 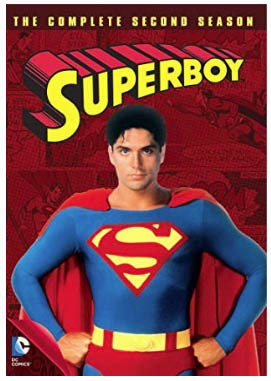 Now that we have the first Saturday morning incarnation of the Man of Steel on DVD (for more see below) - and does anyone remember the Superboy series from 1988 - 1991? 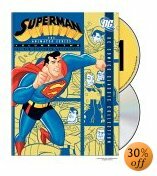 That series arrived on DVD in 2006 - along with seasons four and five of The Adventures of Superman (in glorious color) - to coincide with the release of the big budget Superman movie that summer. Coincidence? 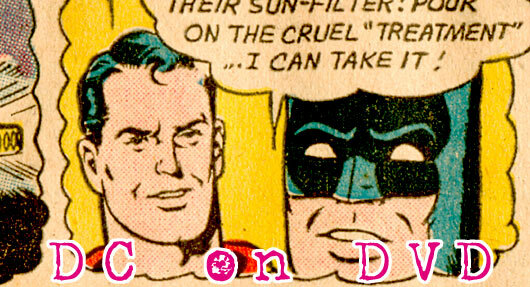 I think not, Mr. Kent! Batman, Superman, Robin and Wonder Woman are all here along with guest heroes Black Vulcan (why did all of the black superheroes of the 1970s had Black in their names?) Hawkman & Hawkgirl, Green Lantern, Rima, and The Atom. 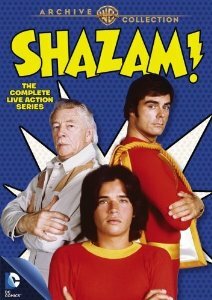 This is the classic series (the 1977-78 season) with the Wonder Twins and Gleek the Space Monkey ("Wonder Twins powers activate! 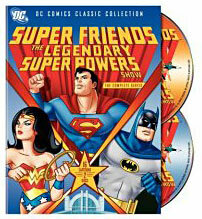 "), a vast improvement on the original Super Friends show, the animation and the storylines are much improved. Your kids are sure to enjoy this as much as you did at their age. The All New Superfriends Hour is a collection of simple tales of the familiar DC superheroes battling weird monsters and malevolent space aliens. It's noisy and rambunctious; there's no violence to speak of but plenty of excitement for the young ones. You won't believe how crisp and clean these bright and colorful cartoons look, especially when you consider how dirty they were originally; there was always a massive amount of dust and dirt on the animation cells of those HB productions from the 1970s. There are a couple of bonus documentaries - the origins of the guest heroes and an insightful look at the Super Friends series and the era they sprang out of. Also included is a rousing preview of The New Frontier animated movie that details the origin of the Justice League and it promises to be fantastic! This enjoyable version of the Super Friends franchise originally aired in 1984, the 6th incarnation of the DC Comics' Justice League derived series that garnered huge ratings for many years on ABC Saturday mornings. This variation introduces Jack Kirby created villain Darkseid (and other New Gods characters) while Cyborg & Firestorm join the Super Friends replacing Aquaman. Most of the bad guys consist of Superman comics standbys - Lex Luthor, Brainiac, Mr. Mxyzptlk and other colorful types. Many believe this was the best of the various Super Friends concepts. Overall Super Friends: The Legendary Super Powers Show is enjoyable if you grew up on this stuff. Super Hero fans will enjoy it as will the kiddies; good clean wholesome family fun with a minimum of violence and a few life lessons for the little ones. You get all 16 episodes (totaling 8 half hours) on this deluxe 2 disc set and there are some fine extras including a couple of mini-documentaries and insightful and charming commentaries on 5 episodes. In addition to this core group of six, episodes during this season featured cameos by old and new Superfriends. 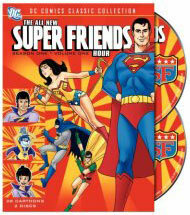 Superfriends: The Legendary Super Powers Show premiered on the ABC television network on Saturday 1984- 1985. 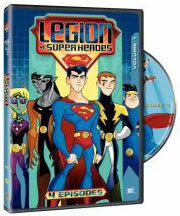 There have been numerous interpretations of Batman, Superman, Justice League, Teen Titans and now another teenage super group comes to DVD, The Legion of Super Heroes, a popular franchise that began in the comics back in the late-fifties only to grow into super-popularity in the mid-sixties, seventies and eighties. This genuinely exciting cartoon is fairly true to the original comic book storylines. In the first episode, based on a two-part comic book story from the mid-sixties, the futuristic teens travel through time in a bubble to recruit Superboy (well, he calls himself Superman) to battle the Fatal Five. 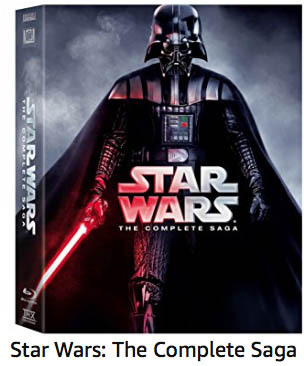 The subsequent three episodes don't quite match the effectiveness of the first, descending too often into wall to wall mindless fighting, but there is a Star Wars-ian quality to the series. It's imaginative and great for the kids and you'll may enjoy it as well if you grew up on Legion comics as I did. All the core characters are here, besides Superboy/man there's Brainiac 5, Saturn Girl, Lightning Lad, Phantom Girl, Timber Wolf, and even Bouncing Boy. The animation is snappy, the designs are all of the Bruce Timm school of drafting (does every modern superhero animation designer owe Bruce Timm a residual?) which means everyone is impossibly angular and oddly proportioned as is the style of the day. It's all very effective - even if Brainiac 5 does look and sound like a girl. 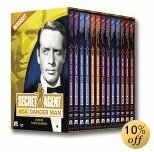 This DVD collection contains 4 episodes from the first season along with a behind-the-scenes documentary on the making of the mini-series. Only $12.99 if you order online now! 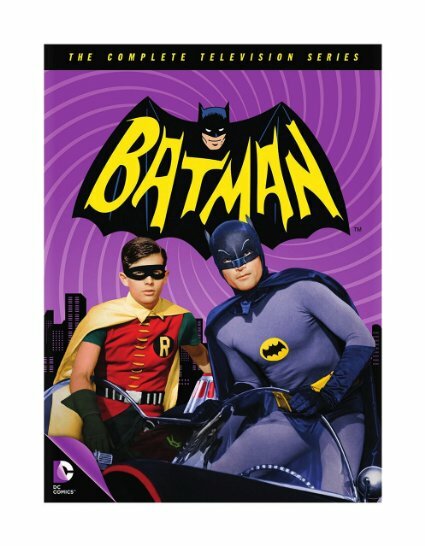 Kevin Butler writes about some new DVDs for classic TV lovers: Warner Home Video has released The New Adventures Of Superman and The New Adventures Of Batman on DVD. 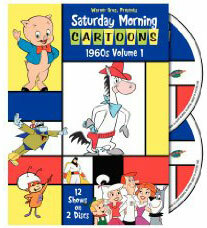 The New Adventures Of Superman was the first series of TV cartoons that Filmation created and produced for CBS TV's Saturday morning schedule in 1966. The only disapointments about this package is that there is no commentary track or documentary about the creation of the series. Also, The Adventures Of Superboy segments which were a part of the program were ommitted due to legal hassles from the Jerry Siegel estate. 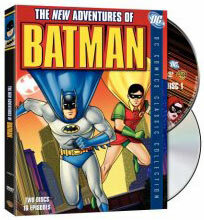 The New Adventures Of Batman has commentary from the series co-producer and creator Lou Scheimer and from Filmation historian Michael Swanigan plus a documentary about the creation of the very first Batman TV cartoons. 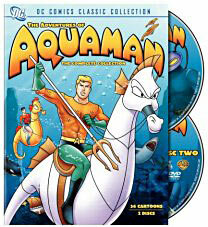 First time on DVD: cartoon segments from The Superman- Aquaman Hour of Adventure! You won't believe these looooow prices - seriously! Classic TV Commercials / 1950's TV / 1960's TV / 1970's TV / Groucho vs William F Buckley / TV Games / Honey Boo Boo / Lucy Shows / Classic Cars / John Wayne / Gene Roddenberry / Rockford Files / Sea Hunt / 1970s Commercial Jingles / Superman on DVD / Toy Gun Ads / Flip Wilson Show / Big Blue Marble / Monty Hall / Carrascolendas / Mr. Dressup / Major Mudd / Chief Halftown / What's In Oprah's Purse? / Baby Daphne / Sheriff John / Winchell & Mahoney / Fireball X-L5 / Mr. Wizard / Captain Noah / Thanksgiving Day Specials / Disney's First Christmas Special / Saturday Morning Cartoons / Amahl & the Night Visitors / Holiday Toy Commercials / Lucy & Desi's Last Christmas Show / Joey Heatherton / Fat Albert / The Virginian / Bewitched / Death of John Wayne / 1974 Saturday Mornings / Chuck McCann / Rudolph Collectables / Shrimpenstein / Local Popeye Shows / New Treasure Hunt / 1966 ABC TV Shows / 1967 TV Shows / 1968 TV Shows / Ric Flair, Dusty Rhodes & Baby Doll / Fridays / TV Moms / Red Skelton / Star Wars / KISS / Lancelot Link / Saturday Morning Cartoons / Wonder Woman / Classic Comic Books / Andy Griffith / Cher / TV Shows on DVD / Outtakes & Bloopers / 1967 TV Shows / Romper Room / ABC Movie of the Week / The Goldbergs / Daws Butler Commercials / Saturday Morning Commercials / Captain Kangaroo / Chicago Local Kiddie Shows / Boston Local TV / Philly Local TV / NYC Local Kid Shows / Amos 'n' Andy / Electric Company / Bette Davis / Judy Garland / Christmas Specials / Redd Foxx / Good Times / Sitcom Houses / What's Happening! / Winky Dink & You / Sonny & Cher / Smothers Brothers / Commercial Icons of the 1960s / Soupy Sales / The Carpenters / Route 66 / Bozo / The Carpenters Christmas Specials / Local Kid Shows / Death of TV's Superman / Wonderama / Sesame Street / Bob Hope Specials / Little Rascals / 1980's Retro Gay T-Shirts / 1980's TV Wrestling / Fess Parker / Howdy Doody / TV Blog / Lost In Space / Pinky Lee / 1980's Punk Rock / Alex Toth Book / TV Terrorists / Irwin Allen / The Untouchables / Carol Burnett Show / Batman TV Show / Green Hornet / Today Show History / Our Gang / Doris Day Show / 1970's Commercials For Women / Bill Cosby in the 1970s / The Golddiggers / Lola Falana / 1970s TV Shows / David Bowie on TV / Hudson Brothers / Jackie Gleason / Hollywood Squares / Match Game / Bob Keeshan / Gumby / The Flip Wilson Show / Glen Campbell Goodtime Hour / The Bobby Darin Show / The Richard Pryor Show / George Burns / Lucy's Lost Christmas Special / Classic Christmas Toy Commercials / Cricket On The Hearth / 1950's Holiday Shows / Amahl and the Night Visitors / A Christmas Carol on TV / The Yule Log / Celebrity Commercials / Rudolph / Movie Posters & More!